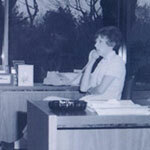 Extension 19 Answering Service was founded by Billie (Szabo) Stubblefield in 1974. Billie worked for Pacific Telephone Company in California, Chesapeake & Potomac in Maryland, Southwestern Bell Headquarters in St. Louis, Missouri; before transferring with Southwestern Bell to Houston, Texas in 1971. Three years later, she purchased a small answering service, beginning with just 7 clients. At that time, the hardware requirements were quite different as every client required a hard line extension to be connected directly to our office, hence our name Extension 19 Answering Service. As the number of clients grew, they were routed to a switchboard that was supported by a system of paper notes to collect, organize and relay the messages to the clients. Eventually, the advent of call forwarding and personal computers allowed Extension 19 to offer more overall flexibility and specialized service, specific to each client’s needs. Andie Szabo-Denley, daughter of Billie, became President after graduating from Texas A&M University in 1996. Andie has spent her entire life around the business beginning in high school as an operator to learn from the ground up. She would later come home from college on weekends and started taking on some of the management duties at this time. After working her way through the business, she officially took over from her mom. Extension 19 has been and is a very important part of Andie’s life. She is recognized by the Rotary Foundation of Rotary International as a Paul Harris Fellow Recipient. She has also won several awards for Business of the Year and Volunteer of the Year. Andie balances the responsibility of this family-owned business by spending quality time with her husband, son and many animals. When she is not at home or work, Andie pursues her other passion which is raising and showing Arabian horses throughout the U.S. Andie lives, works and contributes to the community where she grew up. Tracy Weed joined Extension 19 as Director of Operations in 2016. 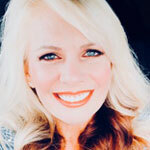 Prior to joining the company, Tracy was the Branch Manager of a large finance company that extended credit to individuals where she was the top producer in loans, lowest delinquency and developed a stellar reputation. 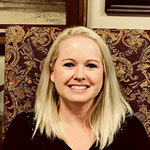 Few people know that Tracy began her career with Extension 19 Answering Service twenty years ago, fresh out of school. Tracy impressed Andie Szabo, owner of Extension 19 then and they remained friends over the years. When the Director of Operations opportunity became available, Andie Szabo knew that Tracy Weed would be the perfect addition to the company with her sparkling personality, commitment, proficiency, and sincerity. Her knowledge and experience of the market, the operation and clients made it the ideal choice. Tracy administers the day to day operations for the company, is the focal point for clients and manages marketing strategies. In addition to being a Director of Operations, Tracy is a wife, mother of two daughters, two dogs and a cat that keep her very busy. Her oldest daughter is a senior at Texas A&M and her youngest will begin her college education this year. She is active in her community and church. We are an award-winning service that employs state-of-the-art equipment for an immense range of vital communication and administration services including live telephone answering, virtual receptionist, inbound & select outbound call center service, auto attendant, voicemail & interactive voice response. From small businesses to fortune 500 companies, a wide variety of businesses take advantage of Extension 19 Answering Services’ live telephone answering service and call center needs. Our people make the difference – we are 100% US-based and never outsourced. The quality of our service is only as good as the quality of the operators who answer the phone. At Extension 19, we take pride in the partnerships we have established with our clients. Extension 19’s account setup is fast, easy and completely customizable. We work closely with you to customize how each call type should be handled and how the messages should be dispatched. Our training, systems, and oversight are all focused on maintaining this high standard. From here, we will work tirelessly to become a seamless integration with your business, never settling for anything less and strive for excellence on every call. Let us be the Extension of your business! Start today and take the first step in becoming a partner with Extension 19 Answering Service. Contact us, or call 1-888-266-9617 today. We will be more than happy to discuss your telephone answering service, virtual receptionist or call center needs.